David Hodgson is going into his second season at the Galpharm Stadium after having a turbulent first year. He suffered a knee ligament injury during pre-season 2008 but recovered towards the end of the season to boast an impressive record of four tries in eight matches. He signed for the Huddersfield Giants following former club Salford’s relegation at the end if the 2007 season. After a great start to his career at The Willows it wasn’t the ideal way for the Salisbury-born player to leave. The former Halifax player joined the Reds from Wigan Warriors where he had an impressive record of 48 tries from 122 Super League appearances. This stint included the 2003 season where he finished as the Warriors’ top try scorer with 20. His second year with Salford was by far his most notable as the team finished in their all-time highest position (5th). 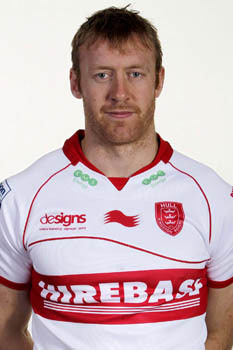 Individually, Hodgson claimed the team’s Supporter’s Player of the Year and Player’s Player of the Year as well as being named in the Super League’s Dream Team. His year was capped with a standby call-up for the Tri-Nations. Having played five times for his country, Hodgson was named in the England training squad for the 2008 World Cup.